Liam is in fifth grade and enjoys playing tennis with his friend Dodge. He doesn't enjoy his younger sister Dakota's antics quite so much-- she loves science, and often conducts ill-advised experiments, such as blowing up watermelons and collecting their dog Cupcake's urine to see why she's peeing on the carpets. Too bad she feels compelled to keep it in the refrigerator in a drinking glass! Because their landlord, Mr. Torpse, lives below them, they have to try to be quiet, not let Cupcake bark, and generally not make the elderly, fractious man irritated. Liam's parents are divorced, and they are both struggling with their jobs. His dad brings dinner over once in a while, but doesn't stay to eat, and his mom after has to work long hours, so occasionally leaves Liam and Dakota in the apartment by themselves, or with Dodge's grandfather, Crash. Izzy has Down Syndrome, so she needs to go to speech therapy and has frequent doctor's appointments. Cupcake's overactive bladder is such a concern that Mr. Torpse is threatening to evict the family unless the issue can be resolved. There isn't money for an expensive doctor's visit, so the children have several money making schemes, from collecting newspapers to winning the science fair. Eventually, it is Izzy who has the good idea to seek a second opinion about Cupcake's problem, and not a moment too soon, since Mr. Torpse is all set to evict the family. Strengths: This is a great book for showing realistic elementary school concerns. Dealing with parents living in different locations, having altercations with siblings, and agonizing over pets are all things far more likely to happen to most children than having a parent die. Money issues affect children deeply, and it's hard for younger ones to realize that these happen to other people, too. Liam shows typical tween embarrassment, but also takes steps to make his situation better. I especially like his interactions with another "nerd" friend at school; he thinks the other boy is cool and doesn't want him to see where he lives, but when the friend finds out, he is very understanding. Weaknesses: The illustrations are great, but it seems completely unrealistic for both of the girls to be wearing skirts. Jeans, leggings, perhaps, but I hardly ever see a student in a skirt! What I really think: This was a lot of fun, but I am debating whether it is too young for my students. This has a similar vibe to Clement's The Losers Club which is just now gaining some traction with my 6th grader. This is a great combination between civil rights and civil war information. It is well-researched and has lots of anecdotes about various people, but it is very dense. Lots and lots of information. Usually, Young Readers Editions give just enough information to make for a fast paced and readable text, but this was a lot, even at the relatively short length of 250 pages. Bolden does a good job at sifting the information, but the writing style still screams "Harvard professor". I'll probably buy this for use in research projects, but it doesn't feel like the sort of book that any but the most dedicated students will pick up for pleasure reading. "This is a story about America during and after Reconstruction, one of history's most pivotal and misunderstood chapters. In a stirring account of emancipation, the struggle for citizenship and national reunion, and the advent of racial segregation, the renowned Harvard scholar delivers a book that is illuminating and timely. Real-life accounts drive the narrative, spanning the half century between the Civil War and Birth of a Nation. Here, you will come face-to-face with the people and events of Reconstruction's noble democratic experiment, its tragic undermining, and the drawing of a new "color line" in the long Jim Crow era that followed. In introducing young readers to them, and to the resiliency of the African American people at times of progress and betrayal, Professor Gates shares a history that remains vitally relevant today." Whoa. 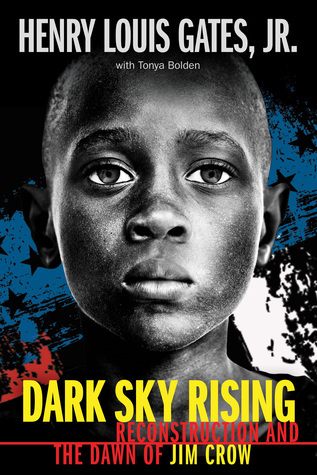 Dark Sky Rising: Reconstruction and the Dawn of Jim Crow sounds very important -- probably a difficult read, but I would really like to get my hands on this one in 2019. It's new to me, so thank you for sharing. Have a wonderful reading week, Karen! There is a lot going on in One-Third Nerd, but it does sound like an entertaining read! Liked your review of Dark Sky Rising, but it does sound like a heavy book. Like your idea of a resource book. I love reading about the reconstruction and the Jim Crow South! Thanks for sharing! I am adding Dark Sky Rising: Reconstruction and the Dawn of Jim Crow to my TBR list. Thank you for sharing your review of it. I agree that it probably has a niche audience, but I think it would be a wonderful literature circle book (if it is good, of course!). I can't wait to read it. So far, I've liked everything I've read of Gennifer Choldenko's, so I will most probably keep my eyes open for this one too. by Ta-Nehisi Coates, and it sounds like Dark Sky Rising deals with much of the same kinds of information. Thanks for these reviews. I am looking for something light and funny. One Third Nerd sounds like it might work. And I do love Gennifer Chondelko's work. There's a shorter (although not lighter in subject matter, but more readable perhaps?) book dealing with similar subjects - Unpunished Murder by Lawrence Goldstone.